I don’t know if you know, but Lady Gaga is an amazing artist and don’t play with me about her. She is quirky and I love that about her. When I found out she was singing on the Oscars I couldn’t wait to hear what it was because she did an album with Tony Bennett and I’m sure it’s amazing. Then, it was music from The Sound of Music. I was ABSOLUTELY THRILLED by her performance. I already knew she was gonna shut it down and she did. Imagine my horror when I found out that my favorite sitcom creator hated her performance. Shonda Rhimes, creator of Greys Anatomy, Scandal and HWTGAWM said it was “not okay”. I just couldn’t believe it honestly. What was wrong with it? 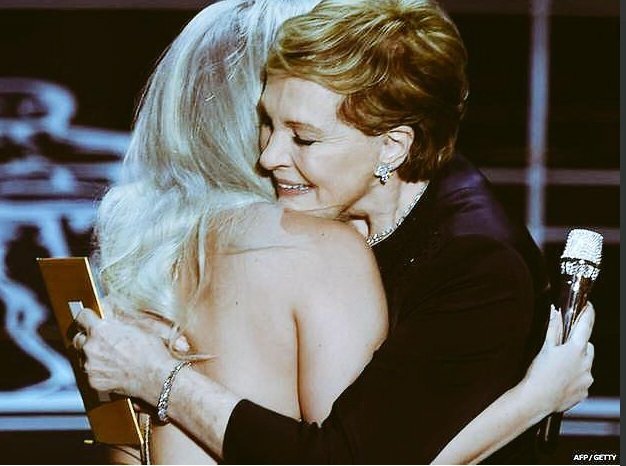 Hell Julie Andrews almost hugged Lady Gaga to death and cried after the performance. Pics from article link below. I think your opinion should not be unduly influenced by Ms. Rhimes! I thought the Lady was lovely and got chills to see her hug Julie Andrews. But that’s only my opinion! Its not at all, I was just shocked because Gaga did her thing.